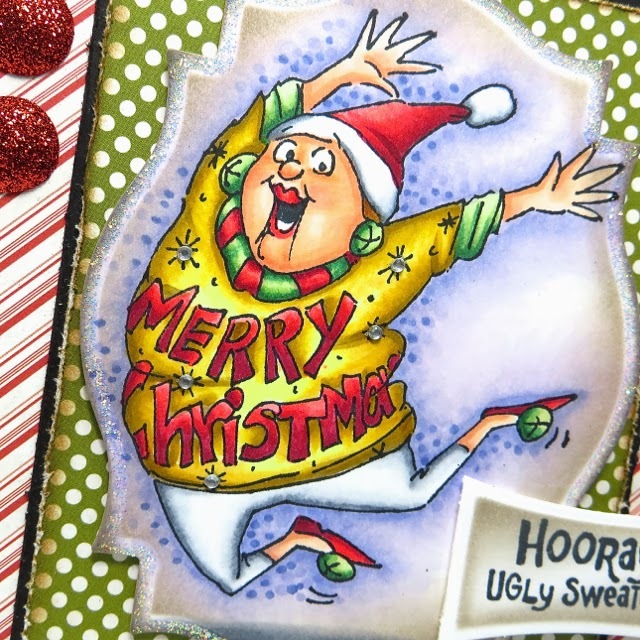 The Ink Trap: It's Ugly Sweater Time with Art Impressions! Hi there! I took a little break over the Thanksgiving holiday to enjoy some time with family and indulge in some fabulous food! I may have indulged a bit too much, 'cuz now I'm feeling a bit like my friend on my card ;) How about you? Did you have to pull out the stretchy pants like I did? The tryptophan haze is finally wearing off and I am slowly coming out of my food coma. Just in time too, because December is here and it is time to get into the Christmas spirit! I absolutely ADORE this fun and quirky image by Art Impressions and nothing Holiday Cheer like this little Miss. She just makes me smile :) In fact, I love ALL of the Art Impressions designs and it's a good thing, because I have the honor of being a part of the Ai Design Team for the next 6-months!!!! YAA HOO!!! Now I really do resemble the happy lady pictured above...LOL! By the way, this stamp comes with the sentiment and is appropriately named Ugly Sweater Set. Pick her up plus many more in the Art Impressions Shop. Also, be sure to swing by the Art Impressions Blog as there are daily postings showcasing their wonderful stamps. LOTS of inspiration over there! Okey dokey, I think I will call it a day. Until next time, stay crafty! Oh I should learn not to drink my coffee whilst blogging - it nearly went over my keyboard I was chuckling so much when I saw this card! What would we do at Christmas without Ugly Sweaters, silly socks and bad taste ties!! Congratulations Cheryl! I think this line of stamps is right up your alley, have a few myself and LOVE them! Ahhhh!!!! I just love that ugly sweater!